SWISS BONE – the essential bone. Complementary food for dogs. 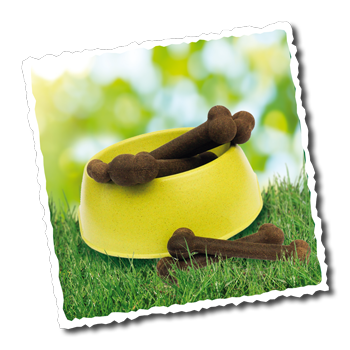 The somewhat different treat: dietary and hypoallergenic – also ideal for dogs with sensitive skin and digestive systems! We developed a special procedure with low temperatures for the SWISS BONE, in order to avoid the usual high temperatures during manufacture. This special procedure ensures the retention of precious nutrients, such as vitamins, enzymes and secondary plant and vegetable matter to the greatest possible extent in the SWISS BONE. 1 SWISS MINI BONE (approx. 47g) is the daily feeding amount for a 4 kg dog. 1 SWISS BONE (approx. 118g) is the daily feeding amount for a 10 kg dog. An adequate supply of water should always be available.